"This is a creamy combination of fresh and pickled cucumbers. It is simple, cool, and goes with everything!" Cube cucumbers and pickled cucumbers, and add to eggs. Mix in mayonnaise. Refrigerate until thoroughly chilled. See how to make a simple, satisfying egg salad. Delicious! I used regular cucumbers and DILL relish (didn't have dill pickles). Added some salt & pepper. Will definately make again! Very good way to use extra cucumbers from the garden. Very light and interesting. 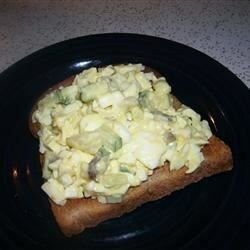 Gives good crunch to ordinary egg salad, plus less fat (used low-fat mayo too- picky husband couldn't tell). This is a good recipe however it seems a little runny/watery to me. I would love it if someone knew a good way to thicken the sauce up. i loved this salad. I made it the night before work and took some in for my co-workers, they want the recipe. I told them where to go to find it and more. Thanks for placing this on here!